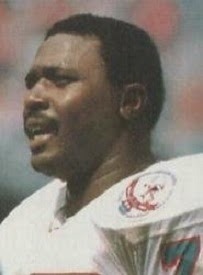 Baker was twice named a Little All-American by the Associated Press and starred on the 1977 Jacksonville State team that contended for the Division II national championship. He was chosen by the Oilers in the second round of the 1979 NFL draft and was used in passing situations in place of Pro Bowl DE Elvin Bethea, accumulating an unofficial total of 15.5 sacks. Baker continued in that role for the next two years, and was credited with 10 (unofficial) sacks in 1981. He moved into the starting lineup for the ’82 season, the first in which sacks were officially compiled for individual players. Oilers went 1-8 to finish 13th in the AFC, divisions having been eliminated due to the strike-shortened nature of the season. Baker had a down season in 1983, still leading the 2-14 Oilers in sacks, but with only 5.5. He bounced back with 11 in ’84. After another lesser year in 1985 he was waived by the Oilers and picked up by Dallas, but was released by the Cowboys after three games and returned to Houston for the remainder of the season. Baker played in nine games in 1987, his last year. Better as a pass rusher than a run defender, Baker recorded an official total of 35 sacks (all but one of them with the Oilers), but when adding in unofficial totals prior to 1982, his actual total was at least 25 more than that.